The graph ranks the teams of the National Basketball Association according to the Fan Cost Index. 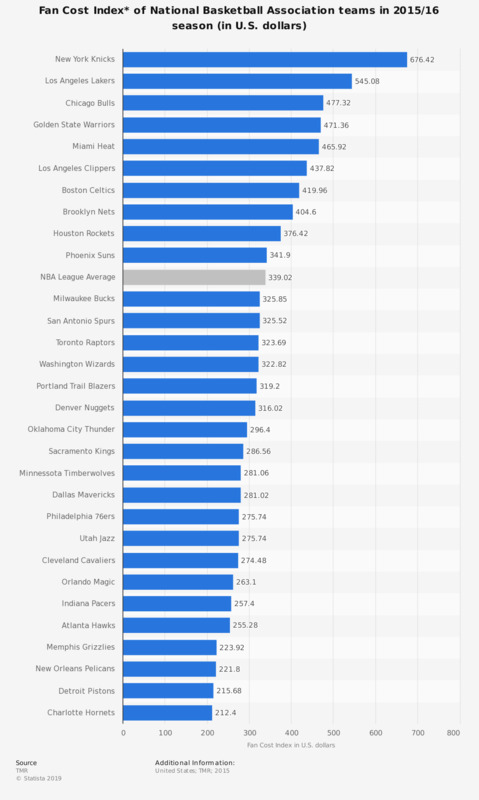 The Fan Cost Index, which thrives to calculate the cost for taking a family to a NBA game, of the Boston Celtics was 419.96 U.S. dollars in 2015. The NBA average is at 339.02 U.S. dollars. *According to the source, the Fan Cost Index comprises the prices of four average-price tickets, two small draft beers, four small soft drinks, four regular-size hot dogs, parking for one hour, two game programs and two least-expensive, adult-size adjustable caps. Costs were determined by telephone calls with representatives of the teams, venues and concessionaires. Identical questions were asked in all interviews.